Have firecrackers burst in your room and let colourful rockets light up the ceiling or have your party crowd go wild with a New Year’s Eve countdown that blasts your room with colour. 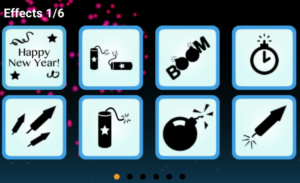 Hue Fireworks lets you create explosive celebrations with a beautiful dynamic interface and exploding fireworks. All you need is the Philips hue connected lights and this app. Darken your room and connect the audio to your speakers. It’s never been easier to get the party going. As a bonus Hue Fireworks allows picking a song from your music library and have your lights respond to the music using the highly popular Hue Disco algorithm. Great to spice up your party. For the best experience we advise to connect to a (bluetooth) speaker. Hue Fireworks has built in delay correction on the light effects when streaming to Airplay or Bluetooth speakers. Play an effect by tapping one of the buttons and see what happens (make sure you have some bulbs selected in the Lights tab). Fireworks sound effects with synced light effects will show. Don’t forget to swipe to the left. There is a total of 48 effects (24 are an optional purchase). While playing effects or just by itself choose on of the moods. These are longer sound effects, also with synced light effects which are more gentle and suitable for playing all night. The fourth mood button (only on iOS) opens your iTunes music library (Apple music is not supported) so you can play your own favorite holiday songs with a soft and smooth lighting. Note! Make sure the song of your choice is downloaded to your device in the Music app. Unfortunately there is no way for 3rd-party apps such as Hue Fireworks to play songs from Apple Music, Apple’s music streaming service. This also applies when songs are downloaded onto your device form Apple Music, as the downloaded files willen be DRM-protected. Use auto-play to play effects automatically. 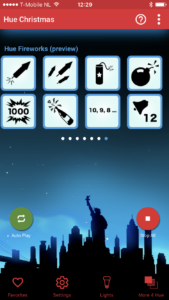 This function will play your selected favorite effects and moods (can be selected in the Favorites tab) for continuous Firework sounds. Tap the stop button to stop all playing effects. Auto-play and mood will stop playing. On the right of the help / manual button which brought you here, there is an option menu. On the left of the help button there is an Audio Route button. Use this to connect to your external speakers or headphone. 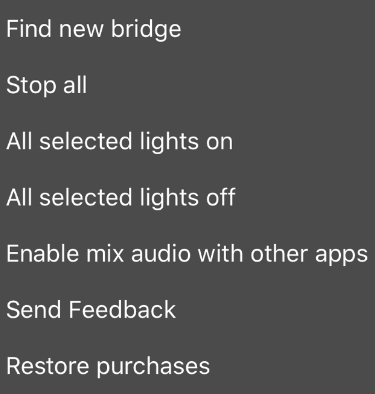 Find new bridge: This will start the find new bridge flow to find a new bridge or switch to another bridge. Stop all: Tap ‘stop all’ to stop alle effects playing. All selected lights on: finished using Hue Fireworks and all is dark or different colours. Quickly put all lights (selected) on. All selected lights off: finished using Hue Fireworks this will quickly turn off all (selected) lights. Send feedback: have a problem or feature request? Please use this method of contacting us! Restore purchases (iOS): if you have ever bought the inApp you can restore this purchase on your other apple devices that are logged in to your iTunes account. Press this button to restore and follow the steps. The first key on the tab bar is favorites. In favorites you can choose the effects and mood you like to play with Auto-Play. Choose your favorites by tapping on the hearts (orange is selected, white outline is not). The play button on the right of the hearts gives a preview of the sound effect (no lights). Don’t forget to include/exclude the moods you like. Moods and effects can play at the same time. The second item on the tab bar is settings. 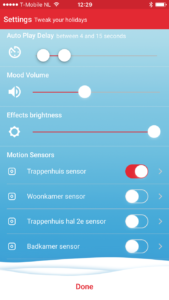 Here you customize the behaviour of Hue Fireworks and configure your Philips motion sensors. Auto-Play delay: set a time range for Auto-Play. When started this will randomly choose a delay between the effects (favorites) within this range. Mood volume: adjust the volume of the mood sounds. Effects brightness: adjust the brightness of moods and effects. This controls how bright your bulbs will be at their maximum level. Motion sensor: a list of your available sensors. Press the arrow on the right of the motion sensor to set the action you want to be triggered when (no) motion is detected. Set the switch to on/off. 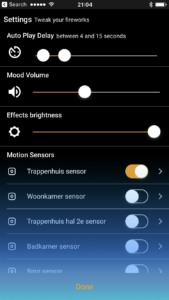 There are four different settings you can choose when (no) motion is detected. Start auto-play: whenever (no) motion is detected Auto-Play will start playing all effects chosen in favorites. Stop auto-play: whenever (no) motion is detected Auto-Play will stop. Start random mood: whenever (no) motion is detected random mood starts. Only the moods chosen in favorites. Stop random mood: whenever (no) motion is detected random mood stops. You can choose several options. 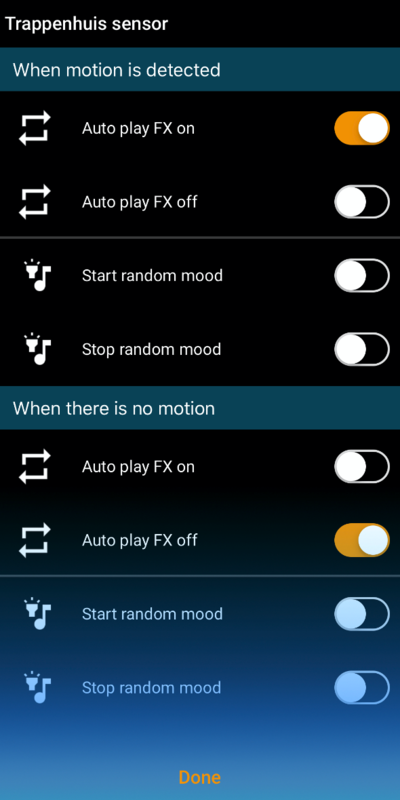 An example: when motion is detected random mood will start and so will auto-play. And after a while when there is no motion detected, auto-play will stop. Mood will continue. Note! Not every combination can be made. When motion is detected it will be impossible to start and stop the same command at the same time. The switches will change when a conflicting choice has been made. The Lights screen shows all your lights registered in your Hue Bridge. Select a room by tapping the switch. Or select single lights by tapping their names. Selected active lights can be identified by tapping on the name of the light and the actual light will blink when selected to help identify it. Lights selected here will be used to create your Fireworks lighting. The lights not selected will not be touched by Hue Fireworks (also not turned off). Use the select all / select none buttons as needed. 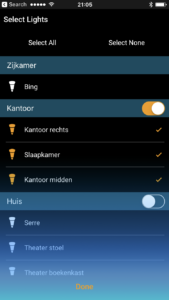 Our other apps for Philips Hue, check them out! They are fun. Hear Santa and Rudolph arrive on their sleigh with magic twinkles flickering through the room. Let the salvation bell ring and and listen to Gregorian Chants while matching lights set the mood. 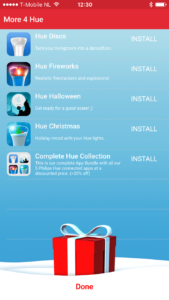 Hue Christmas offers dozens of Christmas sounds in sync with Philips Hue Light effects! Just great. *Hue Christmas works best connected to a stereo by cable or docking station. Bluetooth and Airplay are also supported. Let’s go over the controls and learn how to use them. This is the first screen of Hue Christmas. Play an effect by tapping one of the buttons and see what happens (make sure you have some bulbs selected in the Lights tab). Christmas sound effects with synced light effects will show. Don’t forget to swipe to the left. There is a total of 32 effects (8 are an optional purchase, together with 8 Christmas carols and 8 Christmas tree light patterns). While playing effects or just by itself choose one of the moods. These are longer sound effects, also with synced light effects which are more gentle and suitable for playing all night. 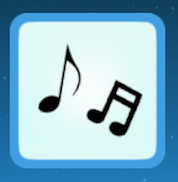 The fourth mood button (only on iOS) opens your iTunes music library (Apple Music is not supported) so you can play your own favorite Christmas songs with a soft and smooth lighting. Note! Make sure the iTunes song of your choice is downloaded to your device in the Music app. Unfortunately there is no way for 3rd-party apps such as Hue Xmas to play songs from Apple Music, Apple’s music streaming service. This also applies when songs are downloaded onto your device from Apple Music, as the downloaded files will be DRM-protected. The optional In App purchase contains 8 effects like you are used in the normal app. 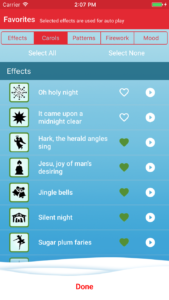 Next to the 8 effects, 8 Christmas carols and 8 Christmas Tree patterns have been added. The carols are eight of the most popular Christmas carols. Full length and with synced light effects. Choose your favorite carols in the Favorites tab and press auto-play and the carols will be played continuously. 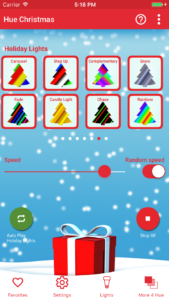 TheThe optional In App purchase also contains 8 Christmas tree patterns. Put some Philips Lightstrips in your Christmas tree and select one of the patterns or press auto-play (select your favorites in the Favorites tab). 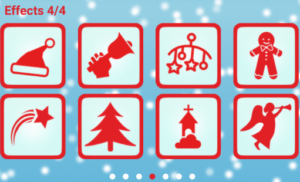 The colors of the Christmas tree icons give an hint of the colors and patterns. But just try them all to see the effects yourself. Use the speed slider to adjust the speed to your liking or press the ‘random speed button’ together with auto-play to play all (chosen) patterns at random speed. The last page of the app is a sneak preview to the Hue Fireworks app. Hue Fireworks is the safest firework in the world with realistic sound and light effects. You can find a link to the full app (only $1,99) at More4Hue at the tab bar. Use auto-play to play effects automatically. 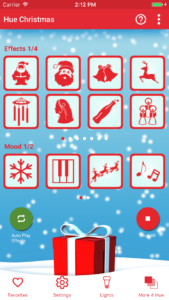 This function will play your selected favorite effects and moods (can be selected in the Favorites tab) for continuous Christmas sounds. Tap the stop button to stop all playing effects. 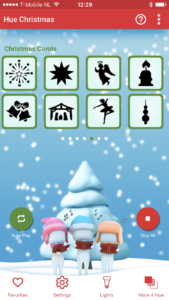 Auto-play, mood, carols and/or patterns will stop playing. Next to the help / manual button which brought you here, there is an option menu. 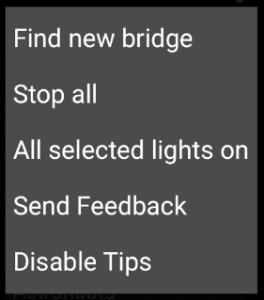 Find new bridge: This will start the find new bridge flow to find a new or switch to another bridge. Stop all: Tap ‘stop all’ to stop all effects playing. Mood, effects, carols, patterns and auto-play will stop playing. All selected lights on: finished using Hue Christmas and all is dark. Quickly put all lights (selected) on. All selected lights off: finished using Hue Christmas. Quickly put alle lights (selected) off. Send feedback: have a problem of feature request? Please use this method of contacting us! Restore purchases: if you have ever bought the inApp you can restore this purchase on your other Apple devices that are logged in to your iTunes account. Press this button to restore and follow the steps. Make sure you select the proper category. At the top of the page you can switch between ‘Effects’, ‘Carols’, ‘Patterns’, ‘Firework’ and ‘Mood’. Then choose your favorites by tapping on the hearts (green is selected, white outline is not). The play button on the right gives a preview of the sound effect (no lights). Don’t forget to include/exclude the moods you like. Mood and effects can be Auto-Played at the same time. Carols and Patterns both have a separate Auto-Play. The second item on the tab bar is settings. 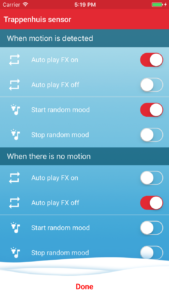 Here you customize the behaviour of Hue Christmas and configure your Philips motion sensors. 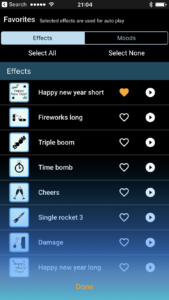 Effects brightness: Adjust the brightness of all moods, effects, patterns, carols and fireworks. Controls how bright your bulbs will be at their maximum level. Motion sensors: a list of your available sensors. Press the arrow on the right of the motion sensor to set the action you want to be triggered when (no) motion is detected. Set the switch to on/off. Start auto play: whenever (no) motion is detected Auto-Play will start playing all effects chosen in favorites. Stop auto play: whenever (no) motion is detected Auto-Play will stop. Note! Not every combination can be made. When motion is detected it will be impossible to start and stop the same command at the same time. The switches will change when a conflicting choice had been made. The Lights screen shows all your lights registered in your Hue Bridge. Select a room by tapping the switch. Or select single lights by tapping their names. Selected active lights can be identified by tapping the name of the lights and the actual light will blink when selected to help identify it. Lights selected here will be used to create your Christmas lighting. The lights not selected will not be touched by Hue Christmas (also not turned off). Use the select all / select none buttons as needed. Hue Outdoor for Philips Hue is a beautiful soundscape collection with matching procedural light scripts that run alongside. With presets like ‘Dawn chorus’, ‘Woodland’ and ‘Evening meadow’ you will find yourself in peaceful surroundings with all kinds of birds and other sounds of nature. ‘Asian garden’, ‘Frog pond’ and ‘Tropical beach’ all have their unique themed sounds and colors to wander off into those surroundings. And with the ‘Farm’ and ‘Roof terrace’ themes you’ll be immersed into the world of cows, chickens and tractors or on top of a Roof terrace in the city. Out of the box it’s perfectly balanced the way we think suits each preset best. But if you like, a lot of settings can be customized. Turn off the wind or add a bird or two. Don’t like our colors? Choose you own that matches your mood. We will save all your customizations between sessions. This is the first screen of Hue Outdoor. Play a preset by tapping one of the pictures. See and hear what happens. Outdoor sounds with synced lighting effects will start playing. Don’t forget to swipe down for more presets. For the best experience we advise you to connect to a (bluetooth) speaker or headphones. Hue Outdoor has built in delay correction when streaming to Airplay or Bluetooth speakers. Once you’ve selected a preset, the preset setting screen will show. You can adjust the brightness of your (selected) lights with the brightness slider. If you like another color tap the manual color switch to choose your favourite color using the slider that appears below the switch. Dynamic saturation will make the lights change smoothly within the chosen color to make it more lively. Every soundscape consists of several sounds categories, which contains one or multiple sounds. You can adjust the soundscape to your own liking by using the different sliders and controls. Occurrence controls: if there is an upper slider, you can adjust the occurrence of the sound and light effects. Volume controls: The bottom sliders are volume sliders. Adjust all different sounds to your own taste. To mute a sounds and cancel the light effects completely, tap the switch. Single shot: press a pulsating icon of the effect you want to hear directly. If provided, the chosen effect will start immediately. Scroll down to find ‘mute all sounds’. If you do only want the light effects, use the switch to mute all sounds. Changed all sliders and want to get back to the original soundscape. Use Reset to default. All sliders will go back to their original (default) state. Use the play/pause button to start or pause a preset. Tap the white down arrow in the upper left corner to go back to the main screen. Whenever you’ve dismissed the preset settings screen and a preset is still playing, the now playing screen will appear just above the tab bar. Press the black up arrow to go back to the preset settings. Press the play/pause button to pause or resume the preset. Use the audio route button to connect your speaker. In the right upper corner there is an option menu. Find new bridge: reconnect to your bridge or connect to another bridge. Stop all: tap ‘stop all’ to stop all playing presets. All selected lights on: when you want your (selected) lights set to a sunny state after using Hue Outdoor, use this button. The Lights screen shows all your lights registered in your Hue Bridge. Select a room by tapping the switch. 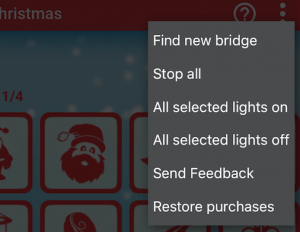 Or select single lights by tapping their names. Selected lights can be identified by tapping the name of the lights. The actual light will blink when selected to help identify it. Lights not selected will not be touched by Hue Outdoor. Use the select all/select none buttons as needed. Tap the clock in the tab bar to enter the timer menu. Choose a time after which you want Hue Outdoor to stop automatically. To cancel the sleep timer, choose “off” in this menu. 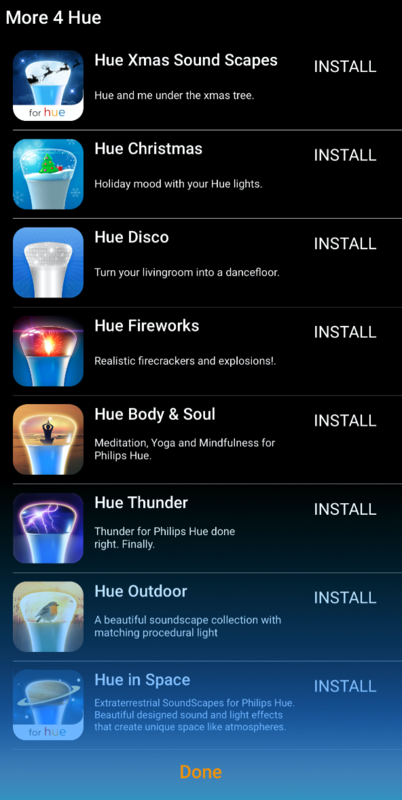 Our other apps for Philips Hue, check them out. They are fun!